As a member of the Fold3 team, I’m always looking for ways to personalize a story to show how our military records are much more than just records. They represent lives, sacrifice, and service. When I started researching this month’s blog post, I had no idea the personal angle I would find would be my own. This is the story of how I learned that my grandfather helped liberate Ohrdruf concentration camp. 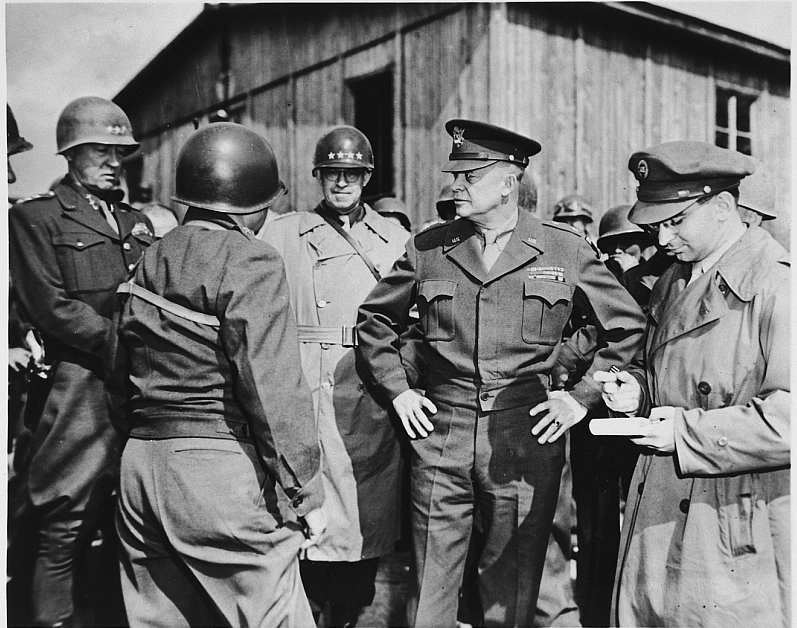 On April 4, 1945, Ohrdruf concentration camp became the first camp liberated by U.S. troops during WWII. Ohrdruf was a subcamp of Buchenwald and was located near the town of Gotha, Germany. As the 4th Armored Division and the 89th Infantry of the Third US Army approached the gates at Ohrdruf, the sights that greeted soldiers shocked them and defied description. The sights and smells of the camp left indelible marks on the soldiers who were there. I know, because my grandfather LaMar Norton was one of the liberators and his experiences were so difficult to share, that most of the family wasn’t aware of this remarkable fact. He was unable to talk about the war without his eyes brimming with tears. LaMar served in the Fourth Armoured Division, Third Army, Company C, during the Battle of the Bulge. He suffered from PTSD after the war and was known to duck and cover during a clap of thunder or when a balloon popped. We knew he’d seen atrocities, but he never shared the details, and everyone learned not to ask. He passed away in 1996 leaving us with unanswered questions. To honor his service, I’ve recently been curating content to create a Memorial for him on Fold3. I reached out to extended family asking for any photographs or stories that could be included. At the same time, I was simultaneously researching the liberation of Ohrdruf. One morning I woke to a message from a second cousin. She had an old, typed history of my grandfather’s service that his brother had compiled. I anxiously read it and my heart skipped a beat when I came to the paragraph where he described helping to liberate Ohrdruf. I suddenly realized that the story I had spent hours researching, was my really my story and my history. According to LaMar, the Americans could smell Ohrdruf before they saw it. The approaching Army had prompted the Germans to flee, but not before shooting as many prisoners as possible. When the Americans arrived, the ground was still wet with blood. LaMar said there were 27 bodies out in the yard and a few more by the gate and at least one body was that of an American. “This American pilot had been carried outside on a stretcher and shot in the head,” he said. As US Soldiers tried to process what they were seeing, military officials told them to leave everything untouched. General Patton wanted the scene documented for possible future war crimes trials. Though Ohrdruf was the first concentration camp liberated in April 1945, it wasn’t the last. Before the month was through, at least eight other concentration camps were liberated by Allied forces including Buchenwald, Dora-Mittelbau, Westerbork, Bergen-Belsen, Sachsenhausen, Flossenburg, Ravensbruck, and Dachau. On May 7, 1945, Germany unconditionally surrendered to Allied forces clearing the way to bring an end to WWII. My grandfather was discharged in October and came home a changed man. Along with many others, he spent the rest of his life trying to make sense of what he’d seen and experienced at Ohrdruf. If you would like to learn more about the liberation of concentration camps during WWII, search Fold3 today. My great uncle Milo burton steeley liberated Dachau concentration camp where his brother junior Steeley was being held as a prisoner of war .. they looked for eachother at time of liberation but sadly were not reunited to their homecoming in october. I’ve been studying the liberation of the camp at Dachau for about 20 years. I must tell you that there were no known POWs in the camp at the time of liberation. Any idea what unit your Great Uncle Steeley was in at the time? Or how he discovered that his brother was a prisoner there? In my research, I have found that many GIs who liberated camps have become confused about which camp they helped to liberate. For instance, there were several sub-camps of Dachau, and a POW complex at Moosberg, not far away. I suspect that if your Great Uncle knew where his brother was being held, that it was not in a concentration camp, but rather in a POW camp. I will be happy to discuss this further, if you have an interest. He was a POW in Stalag 7A, Moosburg (near Munich, and not too far from Dachau) and at two work camps in Munich. can man be so cruel. Two was how wonderful some humans can be to come to the aid of our fellow man. God gave us (America) as a gift to be a light in accepting our fellow men of all countries, religions and races. Let us live up to His gift. And there are some monsters who deny that it even happened; or lament that they didn’t finish the job. Yet today 74 years later this account brings tears to my eyes. For years I’ve felt animosity toward the German people for the possible compliance. Now I realize many of them were also captives, hence the couple that hung themselves. For centuries upon centuries we humans have inflicted great misery and horror upon our fellow man. I believe it will never end. My uncle was among those who first entered Dachau. That was the only thing he’d ever say about it. Any further question just got a shake of his head and no reply. He couldn’t talk about it even decades later. Len Lehman, obviously you’ve never been to Dachau or any prison camp like it. Perhaps you should educate yourself, for some of us who lost family in this war. Your’e obviously delusional & unwilling to read about German’s atrocities. Please read & educate yourself, it’s a worthwhile read. Folks, what started as a historical, informative illustration of the ugly trials of warfare has now evolved into tirades of petty political agendas. The ones that started it are ignorant, don’t get it and should be ashamed. To the others, don’t add to it. Thank you, and let’s get back to hearing some more historical information about the concentration camps which is what this post is about. Yes, thank you! There are plenty of political sites you can go to and give your opinion about todays political climate. I would rather read and discuss history. I agree with the Stop The Political comments. This isnt the time or place. We should be showing respect to our Great USA Military, POW, KIA, Veterans, and ANY and all innocents that suffered. My father served in both Korea and WWII. He lived with a bullet in his side from WWII until the day he passed in 1997. It caused him a some discomfort however removing it could have left him paralyzed. He opted to live with his momento from the War. Im taking up for my dad. We should be thinking of them on this site. Not political jabs. Find another site. Theres plenty. I am a Christian & believe the Bible, Gods’ Word. It was satan who causes people to sin (do all this evil). The Bible tells how it will end. People will continue to do evil until satan is put into the lake of fire. Folks need to love the Lord Jesus and love others. I am 82 and I remember WWII. I have family who were there in Germany & the Eastern Front. They would not talk either. An uncle of mine was a conscientious objector and served with the Red Cross in WWII. He was in the first party of civilians to enter Belsen. My mother said he was never the same again. I understand that Belsen-Bergin was one of the worst. Of course, they were all really bad. I can’t even imagine what that would be like. Just visiting Dachau has left a sobering impression on me. I think this act of madness should be taught in all schools in US. 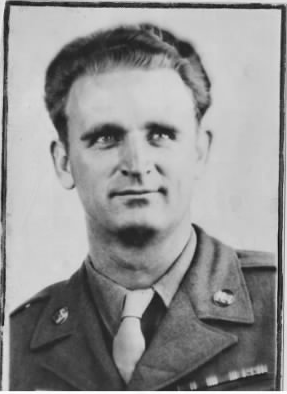 My dad, Donald Wilson, was part of the liberating troops of Ohrdruf. He rarely spoke about it. It always brought him to tears. He did speak of the mayor and that always brought anger – they knew. This blog has been such an awesome history lesson for me. It’s so sad, but so historical that I can’t quit reading about everyone’s family’s experiences. My Dad didn’t serve because he had flat feet, but he stayed home and kept the wives from having to tend to mowing their lawns, keeping boys in school and not letting them enlist before the appropriate age, and was in charge of the Volunteer Firemen in Cisco, Texas. Those are the stories I was told about the war. My husband’s biological father was a navigator in WWII and was killed in a B-17 over Tunisia 2 months before my husband was born. My heart goes out to you, it must have been difficult researching this topic so close to you, and your family. You have done a great service. Bless you. That’s why we served……..so we can all be free to vote………if we are a citizen…. I have read a wonderful book titled The Hiding Place by Corrine Ten Boom. It is an excellent read on the same order as Ann Frank. It’s about Ravensbrook. My uncle Carl Eugene Shepard also had a similar story. It was so bad, that he refused to tell any of the details. He was trained by the army to be a German translator and is said to have been at the Nuremberg trials. Jenny I am so proud of you. What a fabulous job you’ve done. I love all the comments. I’m sure Grandpa LaMar has noticed and he’s going to give you a great big hug when you get to heaven. I love you.